Embryonic stem (ES) cells are like blank cells that give rise to every type of cell and tissue in the body. In Nov., 2007, scientists reprogrammed human skin into stem cells. That technique used cancer causing viruses which remained in the created stem cells. 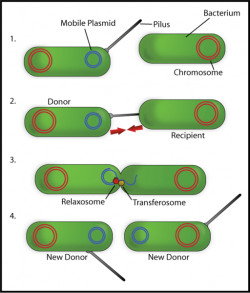 Such genetic baggage posed safety concerns for potential therapies like cell transplants, and confounded work in the lab, as the introduced genes sometimes spurred mutations that interfered with the normal function of induced cells. Now, by using a plasmid rather than a virus, James Thompson and Junying Yu have converted adult skin cells into pluripotent stems cells that are completely free of vector and transgene sequences. This is a major advance toward safely reprogramming cells for clinical use. The new viral vector-free iPS cells will be available to researchers almost immediately through the International Stem Cell Bank at the WiCell Research Institute.